Ever reach into your bag for your ear buds, only to come up with a handful of tangled, hopelessly twisted cord? It’s an annoying problem that has ended up in more than a few ruined pairs of ear buds. The Other Edge designed this clever little headphone organizer to put a stop to the cord madness that’s no doubt happening in the bottom of your bag right this moment. 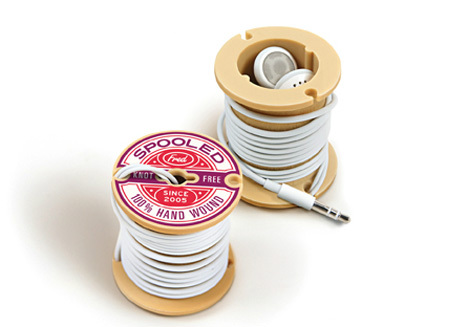 The Spooled organizer looks just like a thread spool. You pull the ear bud cord through the little hole so that the buds themselves are inside the silicon body. 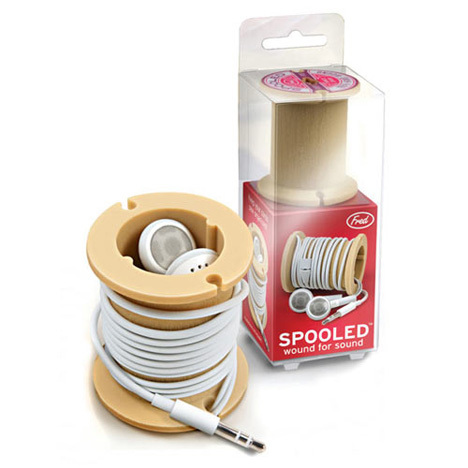 Then you wrap the rest of the cord around the spool and tuck the connector in, keeping everything nice and tidy and maybe even extending the life of your earphones.